Lock-in amplifiers are key devices in numerous instruments used in the optical sciences or in optical equipment in industry. In many experimental configurations, they represent the means to reliably detect and record small or weak signals. The purpose of this text is to provide a step-by-step introduction to this technique. The first part explains how modulation is used to extract a signal from noise and describes different types of modulation. The focus shifts from electronics to optics in the second part, which covers lock-in amplifier applications in optical instruments. The book is intended for readers who want to better understand instruments and experiments based on lock-in detection and/or to design (and perform) new experiments in which lock-in amplifiers are applied. Lock-in amplifiers are key devices in numerous instruments used in the optical sciences and in optical equipment in industry. In many experimental configurations, they represent the means to reliably detect and record very small signals that are superimposed by noise. The purpose of this text is to provide a step-by-step introduction to the technique of phase-sensitive detection using lock-in amplifiers, and to provide examples of its applications in optical instruments. The book begins by explaining the basics of how modulation is used to extract a signal from noise. Different types of modulation are discussed in detail and are compared. 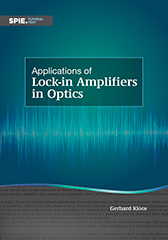 The book then presents the various applications of lock-in amplifiers in optical instruments, and the focus shifts from electronics to optics. Some of the covered optical applications of lock-in amplifiers are optical spectroscopy, including absorption spectroscopy, fluorescence spectroscopy, and phosphorescence spectroscopy; optical interferometry, including detailed presentations of the various spectrometers used with lock-in amplifiers; crystal research and technology, including explanations of magneto-optical, electromechanical, and electro-optical effects; infrared thermography; laser wavelength stabilization; and advanced microscopy. The book is intended for readers who want to better understand instruments and experiments based on lock-in detection and/or to design (and perform) new experiments in which lock-in amplifiers are applied.